Nowhere is this, arguably, more apparent than in the relation of Jonson’s Volpone to Shakespeare’s King Lear. The two plays belong to the same year of theatre, 1605 – 1606. They were both performed by the same group of actors, The Kings’ Men, Shakespeare’s company, and they both respond, though in very different ways, to the dominant concern of the times, the issue of succession or inheritance in the kingdom. Ben Jonson’s Volpone and Shakespeare’s King Lear begin, surprisingly, in comparable if contrasting ways. Surprisingly, in that Volpone is satirical comedy and King Lear sublime tragedy. The difference between the two plays is immense. But they both begin with a test of loyalty and love imposed, one by a king and one by a rich Venetian, on in Lear’s case his three daughters, and in Volpone’s on three Venetian citizens. It is, however, a test of loyalty and love in name only. Lear, or Shakespeare, is using the test as a form of avoidance, of Lear having to choose his successor between Albany and Cornwall as the opening lines of the play emphasize. Shakespeare’s dramaturgical skills are at their peak here in projecting Lear on to the impassioned level of father raging against children and life and also in removing Cordelia out of the scene with her apparent virtue and idealised values. It leaves Lear exposed and descanting above the world of real politic, the world that Ben Jonson saw as the real world to dramatise. Volpone as a character is a reduction of Lear to a figure who knows who he is and what he wants. Possession, power, control are common to both. At least it seems so. Volpone’s opening line says everything. He is a figure whose moral disposition is clear; he is a creature of purpose and wilfulness. He embodies greed, yet possesses an energy of being too strong to be contained in any single immoral quality. He will be other things as the play proceeds. Such a diagram is useful only if it highlights the comprehensive embrace by Shakespeare of opposed social energies and values. Shakespeare creates it as a happening beginning in folly as Lear’s way of testing his daughters, then steadily exposing Lear to learning wisdom of the highest and lowest kinds. The pathos Shakespeare explores is more than Lear (or Gloucester) deserves, hence the pity and terror that are aroused. 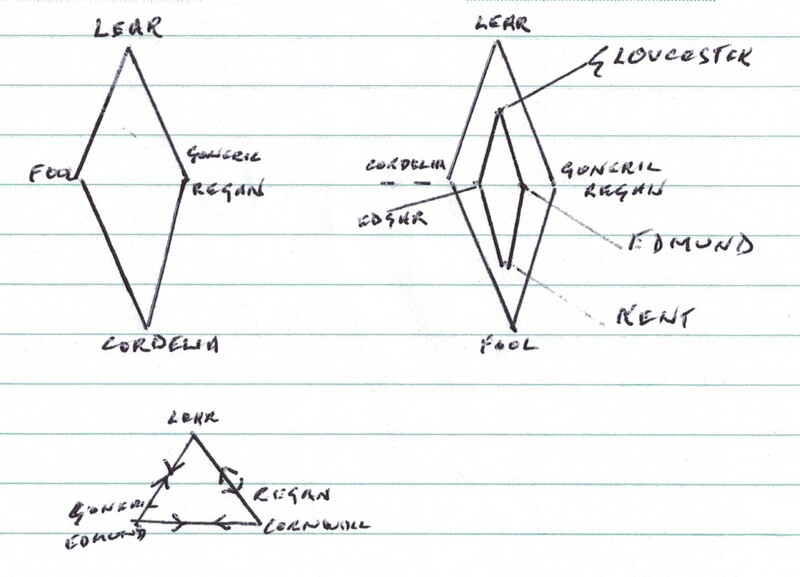 But equally Shakespeare captures Goneril, Regan and Edmund as an energised triangle of politic figures – the ones Ben Jonson saw as really central. “We must do something, and i‘ th’ heat” Goneril tells Regan almost as a figure of farce in Jonsonian terms. Jonson saw drama in Act 1 of Volpone in these same triadic terms. The three sided emphases, repeated three times points to a dramaturgical principle Jonson discovers and relishes. Volpone and Mosca receive visits from Voltore, Corbaccio and Corvino individually, each bringing gifts of money or other valuables in the hope of being written into Volpone’s will as the possible heir. It is, of course, a scam, Volpone having had news spread falsely of his impending death. The three visitations of Act 1 have to be recognised as superb drama. They are unique in the way they pit opposing forces against each other while the process is being orchestrated and interpreted by Mosca in ways that let the audience share in the game. There is, indeed, a logic to these comic scenes that satisfies moral attention while being seen as a game. When Volpone remarks on the old, decrepit Corpaccio “What a rare punishment/ is avarice to itself!” and Mosca adds, “Ay, with our help, Sir.” it is a brilliant way of continuing the Morality tradition of projecting ethical concerns that by Jacobean times had lost its transcendental appeal or reference. Shakespeare had partly handled it in Measure for Measure but not without relying on a higher social authority in Duke Vincentio. Jonson’s genius is in creating Mosca as the third presence. He mediates between author, audience and the stage enactment.